STANDING LUG INFO: I am restoring a Navy 3-1 27ft whaler. When I got the ship it was a wreck and had no mast, some odd bits of rigging and two sails. After a lot of head scratching and research I realised I had a standing lug on my hands. So I made a mast, gaff and parel-hoist and it works like a charm. It also looks really old fashioned which is nice for the classic appearance I was after. If anyone needs help or advice with this kind of rig, give me a shout! I'd hate anyone else to have to go through what I had to! Comments for Standing lug info. She's lovely! Boatporn of the highest order, IMO. That would be fun to sail. Well, with the sail rig sorted and the sweep crutches all refitted in the new wash strake, I've consigned the old Enfield 'Satan's Daughter' 2 cylinder boxer, air cooled lump to the museum. This week we're fitting her with a lovely Volvo Penta MD2D which runs like a Rolex. And next month, after ten years, she'll be back on the water! 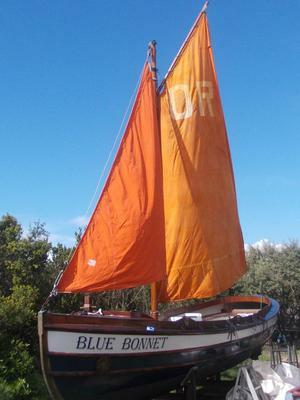 We're launching her on the Lynedoch River at Kleinemonde and all welcome for the spectacle (just so long as you know the words to the Isle of Mann's national anthem). The 5th of July is the IOM's national day, slightly overshadowed by 'you know who's' 4th of July! Well, we were there first guys, sorry about that! That IS nice! I'm just a tad jealous. Hi, I am building an Argie 15 by Dudley Dix and I am going to put a free standing mast with a loose footed standing lug - no jib.